Just being there makes a difference! The Children's Ministry exists to help parents in their ministry to their children. We want every child to have an opportunity to meet Christ, and someday to make a personal decision to receive Him as their Savior. 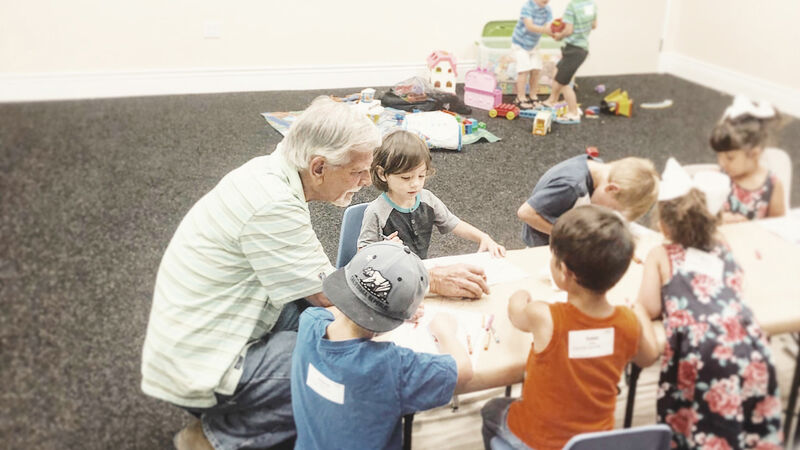 Calvary Chapel French Valley is blessed to have a faithful team of volunteers who take their ministry seriously, and who love the kids God puts into their classroom. One of our classrooms, the Pre-Elementary kids is an energetic group. And sometimes there is a need for a different influence in the classroom to facilitate the ministry they are trying to accomplish. That's where you come in. Scroll down to the bottom of this post to see Monte's Story of how one man made a difference in his son's life. Be available no more than once a month. If you agree to be a part of this area of service, you would serve on an on-call basis. On your appointed Sunday, you would attend service as you normally would. If a need arises for your presence in the classroom a number would be put up on the screens in the Worship Center. You would then go down into the classroom and assist the teacher in any way she requires. Once the situation resolves itself, you can return to the service. You can be involved to make a difference in the lives of these kids, and still hear the message. There are a couple of ways you can do that. Servants Service - Every Sunday at 8:00 am, a special service is held for anyone who will not be able to attend in the Worship Center. There are usually a couple of songs of worship, and the speaker for the day shares the message. BTW - anyone is welcome to attend that service any time. Watch the service online - Shortly after the service concludes, the live service is uploaded to YouTube. That recording includes the whole service, including worship and announcements. Click this link to go to Live Services playlist. Listen to podcast - If you would prefer to listen to the sermon, you can do that through whatever app you prefer. Just search for 'Calvary Chapel French Valley' and start listening today. Click this link to see where the podcasts can be found. How do I get involved to make a difference? It's simple, just fill out the form below. Kevin will get in touch with you. For the safety of the children, everyone who volunteers in the Children's Ministry goes through a background check. Kevin will make sure you get the forms you need, and it doesn't cost you anything. One father's response to a man making a difference. On Sunday morning when Lindsey dropped our son off in childcare he had a huge melt down. Screaming, crying, and even hitting the teachers. Lindsey tried to calm him down but he wouldn’t. I was busy upstairs so I couldn’t come down. When I went to check on him a little later after service got going I saw this happening....I realized I cannot raise my son on my own. That hurts to say but it’s the truth. I need other men to pour into him and guide him also. I’m not just talking regular men, but God fearing men. He has enough men around him cursing, drinking, smoking and living for this world thinking their good morals will get them by. I need men that are striving towards Christ, denying themselves, loving their wives, forgiving the unforgivable and who are striving towards living a holy and redeemed life through Christ.